I am looking to try snow goose hunting. If anyone is willing to have me along, send me a PM. Hunted other waterfowl and animals for quite a long time, but never have hunted snows. I don't mind the work of setting out decoys. Just punch yourself in the nuts 4-5 times as fast as you can...that's snow goose hunting. So I hear, but I still want to try it out. 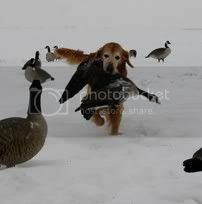 I have had some rough Canada goose seasons that have felt like that. Also, before you commence to punching, lay in 4 inches of just-above freezing mud after you work up a good ball-sweat walking a few miles. Damn you guys, don't scare off the new sucka. Only a snow goose guy can put on 1100 miles on his truck in 2.5 days, sleep 3-4 hrs/night, eat donuts for breakfast, lunch and then have dinner at 9:00 after the birds are cleaned, go to bed at 10-11:00 set the alarm for 3 am. Then get ready to do it again on Sunday. Get home Sunday night all rested and relaxed and looking forward to doing it again the next weekend. Only thing funnier, is when you get home and the wife says we never talk and all you can think of, is that the e-caller needs to be charged and your gun cleaned. You guys are hilarious, don't listen to those old guys! It's a cake walk, throw out a few decoys, shoot 40 or 50 and then have a beer! Easy Peazy! If I were trying to get an invite on a snow goose hunt I'd probably be on the forum a bit more (maybe you are on Facebook and more active in the group over there?) so folks can get a sense of who you are. It would probably be good too to offer something up like a trade for a hunt at one of your spots versus just being the guy who has 6 posts in 4 years and offers to show up with a shotgun and a smile to hunt over someone else's $10,000 worth of gear in their spot? No one who spends a ton of money and time on this sport wants to be an unpaid outfitter. So in other words... don't expect an invite from Spaight. I have know him since I was in grade school. Going on about 20 years now and I have never had an invite from him. I'd invite you but I have a grand total of zero snow goose decoys and I intend on keeping that many. Thanks for clarifying that Chris! Also, I have a total of 12 snow goose decoys so we can save a lot of setup and takedown time. If a snow ever flies over our lease I plan on inviting some innocent nice guy like JCNENG and his bajliion dozen snows out and while they are setting up I will go get burritos at Stub's for the crew for a few hours. We have a 30 hole pit on the lease so if they show up we are gonna fill that sucker and get after 'em HARD! I have seen 30,000 snow Geese in the past ten days but they just fly over sounding like a flock of aging Bar Fly's. Holy smokes! The strong arm lives!